Ophelia Jane Worthington-Whittard is a sensible, practical girl. She trusts science and facts and has no time for stories about ghosts and wizards and magical messengers. She is struggling to adjust after her mother’s death, feeling disconnected from her busy father and distracted sister. Ophelia and her family travel to a snow-covered city where her father is in charge of arranging a sword collection for an upcoming exhibition. The museum contains many wonders that will challenge Ophelia’s sensible outlook on life, especially the young boy without a name she discovers trapped in a room. He claims to have a message from the wizards for the One Other who will defeat the Snow Queen and Ophelia wonders what trick he is trying to play. Gradually, she is drawn into the boy’s story and her adventure begins as she tries to rescue him from his prison and help him find the One Other, who will save them all before the Wintertide Clock chimes and the Snow Queen triumphs over them all. I read Ophelia and the Marvellous Boy with delight. It has such a classic fairytale adventure feel to it with the coldly beautiful but evil Snow Queen, wizards manipulating others to fulfil their prophesy, a magical sword, a hero who seems to be unable to triumph over the obstacles put in place by the villain and a unlikely heroine, who doesn’t believe, but somehow can’t resist joining the quest to see Right defeat Wrong. The museum is the perfect setting, with its labyrinthine rooms and eclectic displays of objects and creatures. The familiar Snow Queen is the perfect villain. Somehow her heartless cruelty is so much more confronting because of her beauty and gracious façade (when it suits her). There is the menacing presence of the misery birds and constant ticking of the Wintertide Clock, reminding characters and readers alike that time is short and the ultimate battle will soon be upon them. The story of the Marvellous Boy nested within a story of Ophelia’s own personal challenges and experiences results in a novel with a wonderful sense of depth and complexity that is also simply entertaining. This is an adventurous tale of Good versus Evil as well as a modern reminder to persevere when life becomes challenging. 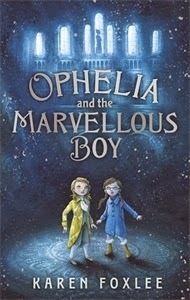 Ophelia and the Marvellous Boy is a story of heroism, love, grief, endurance, conviction, loss and magic. I was touched by the experiences of Ophelia, as she struggled to balance her own world view with the ‘facts’ in front of her and the ever present voice of her mother encouraging her to listen to her heart, and with the sacrifices of the Marvellous Boy, as he strove to fulfil his commission from the Wizards. I haven’t read either of Foxlee’s previous young adult novels, The Anatomy of Wings and The Midnight Dress, but I will certainly be adding them to my reading list for the near future.